You're going to be getting that feeling of being stuck for something to watch on Netflix less often than ever - at least if you have the app installed on a smart TV or games console at home. That's because the video streaming giant is rolling out a new screensaver on its Netflix smart TV apps, one that recommends shows you might want to watch while you're making a drink or chasing the kids or doing anything else when your TV is idle. 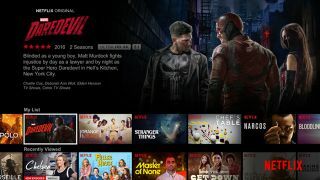 As you might expect, Netflix's original programming is front and center - shows like Daredevil, House of Cards, Iron Fist, The Crown and all the others. The feature was reported by users on Twitter and picked up by TechCrunch. Netflix told TechCrunch that the feature has been in testing for some time and is now rolling out more widely to the apps installed on TVs and consoles. Netflix shows and movies will be promoted through the screensaver, Netflix says. At the moment, there's no way to switch the screensaver off or configure what it shows. Users have confirmed seeing the new feature on Android TV, Fire TV, Xbox One, PlayStation, Roku and several smart TVs platforms. Netflix already pushes its original programming heavily on the app's various screens, but you'll soon be seeing even more in-house adverts, depending on the devices you're using.